CBS investigative correspondent Sharyl Attkisson reports that cameras spotted House Speaker Nancy Pelosiat the summit. She called the shots on who got to go. House Majority Leader Steny Hoyer, and embattled Chairman of the Tax Committee Charles Rangelwere also there. They were joined by 18 colleagues: Democrats: Waxman, Miller, Markey, Gordon, Levin, Blumenauer, DeGette, Inslee, Ryan, Butterfield, Cleaver, Giffords, and Republicans: Barton, Upton, Moore Capito, Sullivan, Blackburn and Sensenbrenner. That's not the half of it. But finding out more was a bit like trying to get the keys to Ft. Knox. Many referred us to Speaker Pelosi who wouldn't agree to an interview. Her office said it "will comply with disclosure requirements" but wouldn't give us cost estimates or even tell us where they all stayed. Senator Inhofe (R-OK)is one of the few who provided us any detail. He attended the summit on his own for just a few hours, to give an "opposing view." "They're going because it's the biggest party of the year," Sen. Inhofe said. "The worst thing that happened there is they ran out of caviar." 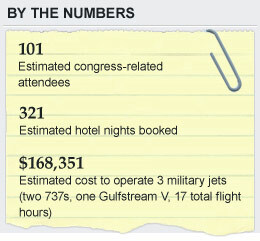 Our investigation found that the congressional delegation was so large, it needed three military jets: two 737's and a Gulfstream Five -- up to 64 passengers -- traveling in luxurious comfort. As a perk, some took spouses, since they could snag an open seat on a military jet or share a room at no extra cost to taxpayers. Rep. Gabrielle Giffords (D-AZ) was there with her husband. Rep. Shelley Moore Capito (R-WV)was also there with her husband. Rep. Ed Markey (D-MA) took his wife, as did Rep. Jim Sensenbrenner (R-WI). Congressman Barton-- a climate change skeptic -- even brought along his daughter. Three military jets at $9,900 per hour - $168,000 just in flight time. 321 hotel nights booked - the bulk at Copenhagen's five-star Marriott. Steve Ellis of Taxpayers for Common Sense, wasn't against a U.S. presence. But he said, "Every penny counts. Congress should be shaking the couch cushions looking for change, rather than spending cash for everybody to go to Copenhagen." Nobody we asked would defend the super-sized Congressional presence on camera. 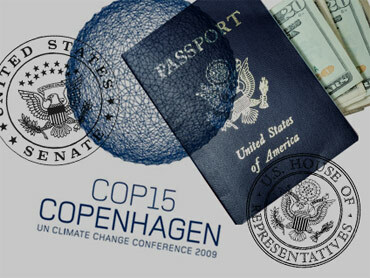 One Democrat said it showed the world the U.S. is serious about climate change. Which means even if Congress didn't get a global agreement - they left an indelible footprint all the same.